Vocal Nodules are masses of tissue that grow on the vocal cords as a result of strenuous misuse of the voice. Vocal Nodules commonly occur in singers, teachers, actors and lawyers. Symptoms of vocal nodules include hoarseness, pain when speaking and/or singing, voice breaks often and loss of vocal range. Females are at a higher risk of developing vocal nodules. Our unique and revolutionary Non-surgical Voice Repair program will not only repair your voice and your vocal box, it will also teach you how to use your voice correctly according to the standards of professional speaking/singing. You will learn how to restructure your voice into your facial muscles - as opposed to your vocal cords - which will minimize the pressure on your vocal cords and box. 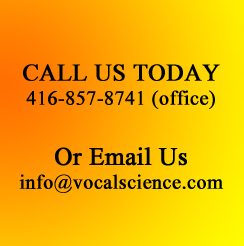 By treating the cause - using your voice incorrectly - and not the symptoms of your problem, your vocal problems will never be an issue again and we guarantee it! Through the application of natural herbs and homeopathic remedies, the vocal nodules will shrink or completely dissolve. Once you've learned how to use your voice properly, you will no longer irritate your vocal cords and that will protect you from the recurrence of vocal nodules. Question: How is your throat? Answer: Good! I feel good. No pain! No strain! Nothing! Question: You were very skeptical to begin with and it took quite an effort to get you in. Was it worth it? Answer: It was SO WORTH IT because I haven't been able to sing since August. And I'd just been so depressed because I couldn't sing. And now I can sing! And I have hope. I know I have to take it slow and practice these new techniques. But I'm so happy that I can sing again and I love this particular technique because I feel so up and positive. I love smiling and biting while I sing. I just think Diana is brilliant with her work and I recommend it highly. I came here with two nodules that were diagnosed in August and I know that they are now either gone or almost gone. I'm so grateful that I know how to sing now so that they won't come back. And I have musician friends and my band back home that want me back singing and I am so grateful that I can sing again. Thank you Diana! "It was absolutely worth it to come to Toronto. It was a fantastic experience. My voice is like night and day. When I first got here I could barely speak. Now one of the nodules is still there - it takes time to heal - but the procedure has been phenomenal and it feels clear on the left side of my throat where the other nodule had been. Learning how to speak correctly - stomach in, body out, projection. I'm still learning, but I'm going to get it. It's phenomenal. I can't say enough." "I feel that as long as I adopt the habits that Diana has given me, I will not tire out my voice. It's easier to speak right now - the more I speak in the manner that she has taught me, the more comfortable my voice feels and the less it feels tired. It was absolutely worth it to fly in, even from Mexico where I was wintering. I feel the clarity and the power in my voice and hear the difference in my voice"
"It was definitely worth it (to travel to Toronto from Key West for the Voice Repair Program) - it helped me to move around the vocal chords. Before I couldn't even speak much during the day because it would just close up on me. But now I'm getting around the vocal chords and nodules while singing. I'd like to come back for more." "It was an awesome trip. I met an incredible brilliant woman who has really helped me a lot - mentally, physically, spiritually, emotionally and vocally. I learned a great deal and I would definitely recommend the course to all singers - period!" "I feel much better. I think this is a revolutionary technique. And I just need to practice it and rehearse and make sure that I am speaking correctly - breathing, supporting, "smiling and biting", make sure that the cheekbone muscles are being implemented properly and visualizing the circles. I'm going to keep working on it and it is my intent to come back for a refresher course. My voice feels much better right now. I came to Toronto with literally a nodule on my vocal chord after effectively having damaged and abused my vocal chords for some time. It was absolutely worth it to come to Toronto from Chicago and I would strongly recommend this course to anybody that is struggling with their vocal chords, looking to not only fix their problem in a healthy way, but to also adopt a new technique that will allow them to speak or sing without abusing their vocal chords." "When I first met Diana, I had what most would consider a strange goal: to speak properly. I am not a professional speaker or singer, but I have suffered from vocal nodules for over 13 years. Since first diagnosed in 1989, I have endured weeks and months with a hoarse voice and sore throat. After 2 surgeries and repeated visits to speech therapists, I was losing hope. From May to November 2002, I hit bottom. My voice was rough and my throat was sore - so sore that it hurt to speak. To compensate for this, I chose silence. I just wouldn't speak unless I absolutely had to. I thought I was doing the right thing by "saving" my voice, especially after I heard that several professional singers wouldn't talk for days before a concert in order to keep their voice in the best condition possible. I am so thankful that I found Diana! She assured me that my self-imposed periods of silence would not be necessary once I learned how to speak properly. She knew exactly what I was doing wrong. It wasn't just how I was speaking - it was my breathing, my posture, and my health. Diana looked at every aspect of my situation and addressed each piece. Her vocal therapy techniques have healed my voice and improved my speaking dramatically. Most importantly, my nodules have disappeared after just 2 months! In 13 years no one else has been able to help me. Diana is the only one who explained what I was doing wrong and what I needed to change. My involvement with her has greatly improved my quality of life, and for that I will forever be grateful." "Before I used to sing for half an hour and my voice and throat were hurting for three days. 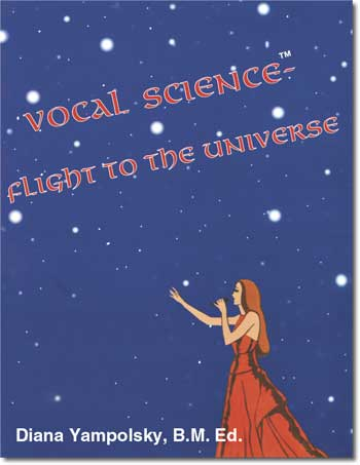 Now, after Diana's course, I just sung for three consecutive days and didn't feel any pain or discomfort in any part of my vocal anatomy."